School started back today. All last week we enjoyed every day outside. Either at the pool, the lake, the zoo, or even just our back yard. But our back yard is starting to look like a playground. 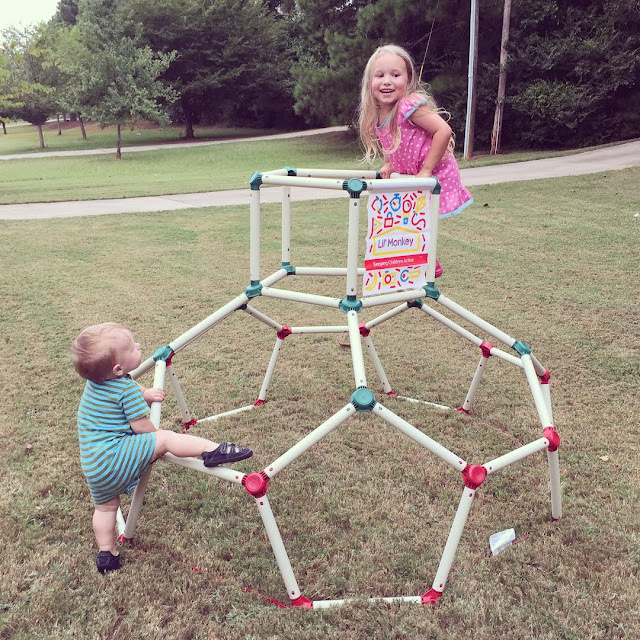 I was recently sent the Lil' Monkey Dome Climber to review and my kids LOVE it! Lil' Monkey is the world's first physical outdoor game that combines a mobile app with augmented reality! It encourages the "screen generation" kids to be physically active and get some fun outdoor exercise. The product combined with the app aids children's developmental and cognitive skills, in addition to keeping them active while having fun. The Dome Climber is the perfect solution for concerned parents who want to ensure their child gets the exercise they need, still enjoy technology, and experience the great outdoors. The kiddos helped Daddy put it together. The Dome has plenty of room to climb all over, hang off, swing and can also be used in role-play or as a den when covered with a sheet or two. If your child is a Monkey and climbs on everything then the Lil' Monkey Dome is a blessing and will get used daily for hours and hours and It will aid with their development and agility and ensure they get some exercise. The Lil' Monkey Dome Climber is just the right height, not too big or too small and low enough to the ground that if your child does fall, it isn't a bad one. The bars are made of sturdy plastic tubes, which are a PLUS because it is more flexible and safer compared to steel tubes. The Dome Climber is stable and strong for its size. It was also relatively easy to put together. The instructions were easy to read and there is a video that can be found below. The Lil' Monkey Dome is virtually weatherproof. Even sitting outside all day in the HOT Georgia heat, when my daughter went to play on it, the bars weren't hot. It is also easily transportable around, if necessary. My husband moved it from the front to the back yard with ease. We are having a blast playing on our Lil' Monkey Dome Climber. 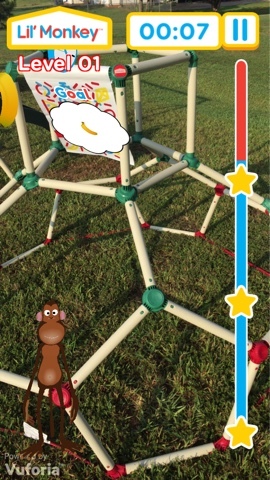 The app is very easy to use, but my daughter has been enjoying climbing on it more. I can't wait for my son to be big enough for it. I know he will love it. And it is available for purchase on Amazon! What do you think of the Lil' Monkey Dome Climber? How do you encourage your kids to get active? That looks like so much fun! It also looks like good exercise and surprisingly easy to set up. What a fun and creative product! This is just the coolest thing. I think it looks so much fun! I just wish I had one of these at my home as a kid. It looks very sturdy!